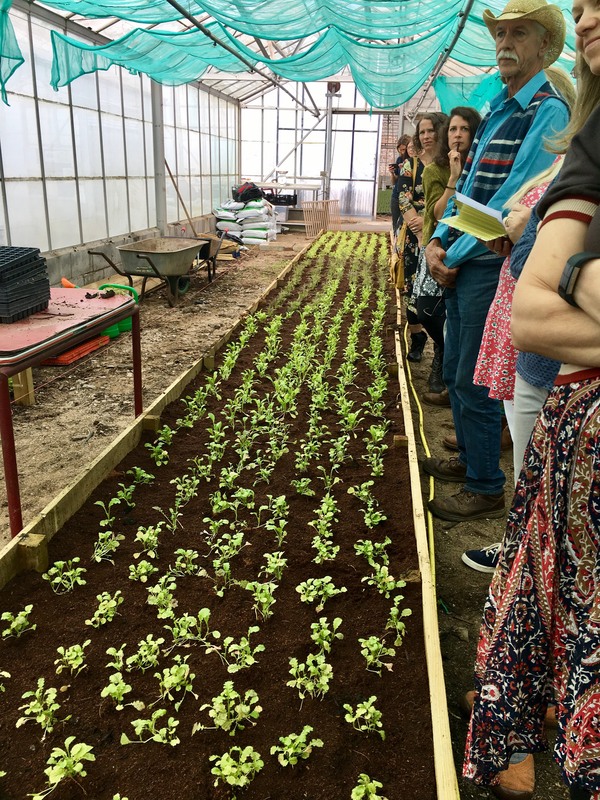 At the beginning of September, around 20 of us from Swansea, Carmarthenshire, Powys and Cardiff come together to visit the site of Cardiff Salad Garden, a project which has been set up by dream team Sophie Durnan and Fissha Teklom. Fissha first spoke to us of their hopes for Cardiff Salad Garden during one of our Community Camps at the Eden Project in February of this year. Since then they have been given some land and a greenhouse in central Bute Park by Cardiff Council and their project has grown alongside the salad. Cardiff Salad Garden is a not-for-profit social enterprise growing and selling fresh cut salad leaves. They grow a range of mixed baby leaf salads all year round for continuous harvesting, which are high quality, unique and picked to order for restaurants in Cardiff to purchase. The garden is also to be used for gardening sessions educating people about food and developing horticultural skills, indirectly working on confidence building, improving social skills, language and promoting positive mental health. They aim to work initially with Asylum seekers, refugees and individuals with mental health problems, but also other disadvantaged groups from within the city. During our visit, helped by Community Land Advisory Service Travel Bursary (which is available to groups wanting to visit similar growing projects to share ideas and good practice) we looked around the greenhouse site and chatted to Sophie and Fissha about how they got their project off the ground. An important message I think we all took from the duo is the importance of sticking to what is do-able, sustainable and healthy for YOU. Developing our projects to their fullest potential is what we strive for, but take care that this does not come at the cost of stretching you too much or cause you to struggle to maintain all of the other demands in your life. Following our tour, we gathered over lunch (of course!) to share learning around the room from each other’s projects. We all came away feeling inspired by the tremendous amount of work that has been put in by Sophie and Fissha, as well as that bit better nurtured by one another. Feeling inspired? We've got lots of ideas for stuff you can do in your community and practical guides to help you get your idea off the ground and there's more inspiration from ordinary people doing extraordinary things, right here!